The NSRC is funded by grant number 1451045 from the International Research Network Connections (IRNC) program of the National Science Foundation and Google, with additional contributions from dozens of public and private organizations. The NSRC works closely with several University of Oregon organizations, including the Route Views project, the Network and Telecommunication Services group, UO Libraries, and the Wired Humanities Project (WHP). The Network Startup Resource Center works directly with the indigenous network engineers and operators who develop and maintain the Internet infrastructure in their respective countries and regions by providing technical information, engineering assistance, training, donations of networking books, equipment and other resources. The end goal in this work is to make it easier for local scientists, engineers and educators to collaborate via the Internet with their international colleagues by helping to connect communities of interest. By strategically working with universities, research institutes, Internet Service Providers, Regional Internet Registries, government agencies, supranational agencies, industry, private foundations and non-governmental organizations, the NSRC helps develop national and regional Internet infrastructure for collaborative research, education, and international partnerships. The roots of the the Network Startup Resource Center (NSRC) trace back to a volunteer effort to support networking in southern Africa in 1988, when Randy Bush designed, taught about, and helped deploy a multi-country (South Africa, Botswana, Namibia, Zimbabwe, and later many others) network using varying technologies, in order: FidoNet on dialup lines, UUCP on dialup lines, low-cost IP technology based on 9600 baud and below links using old PCs and publicly available PC-based SLIP routing software, and finally multiple, dedicated, medium speed (128-512kb) links to the public Internet. In 1991, networkers in Peru asked the NSRC for technical assistance to help connect Peru to the Internet. With some financial support from UNDP and Union Latina, the NSRC facilitated the technical work and training for the first networking within Peru and to establish the links to the US. The NSRC was Peru's UUCP link to the outside world for over two years until Peru was able to upgrade to a 64kb, then 128kb, and then 512kb satellite IP link. In response to a request from Egyptian network engineers, we provided technical help to the Egyptian Universities Network to set up Egypt's first link to the Internet in 1993. In 1994, the African Education division of the World Bank asked the NSRC to help them design a network in Guinea for electronic mail, as they were having grave problems communicating within the country. In September 1994, we went to Conakry and worked with local folks to set up a system for PPP within the country, and dial-up UUCP internationally for the country's first link to the Internet. As there was not a single phone at the university, we used spread spectrum radio modems within Conakry. During 1994-95, the NSRC assisted Sri Lankan engineers to design and deploy Sri Lanka's first TCP/IP link. Responding to numerous requests from networkers in Nairobi, the National Science Foundation supported the NSRC's work to design, install, and train local engineers for the first IP links to Kenya. We have worked for several years with Saudi Arabian academics to help them connect to the Internet. The NSRC was asked by the US National Academy of Sciences, the Government of Indonesia, and the World Bank to catalyze and design the Indonesian academic internet, IPTEKnet, which occurred during 1995-96. Also in 1996, we worked with Bill Sangiwa to bring up Tanzania's first connection to the Internet, with assistance from a longtime NSRC colleague in Lebanon, Nabil Bukhalid, who had experience configuring Ciscos for IP over X.25 encapsulation. In 1997 we assisted Togo in arranging connectivity for its first IP link, and collaborated with Togolese engineers to assist Liberia in designing and building its first connection to the Internet. Current projects in Uganda include working with the Research and Education Network for Uganda (RENU), including Makerere University, which hosts the Infectious Diseases Institute (IDI), and is partially sponsored by the the U.S. Centers for Disease Control (CDC) and the U.S. National Institutes of Health (NIH). As networking matures in a country or region and more ISPs develop, the technical needs shift from obtaining initial IP connectivity to more complex engineering problems, such as setting up cooperative eXchange points to keep local traffic local. In June 1997, we were contacted by the Organization of American States (OAS) and the Secretariat for Science and Technology (SENACYT) of the República de Panamá to help set up a neutral exchange point for cooperative use by the academic network, Red Académica y De Investigación Nacional (PANNet), and all significant commercial providers. Bush and Dave Meyer trained the participating Panamanian engineers about BGP, peering points, the Internet Routing Registry, Autonomous Systems, built the tools to automatate configuration, and helped set up the InteRed eXchange in July 1997 - the first open IX in America Latina y el Caribe. Over the years, the NSRC has provided cost-recovery-only PPP and UUCP links for academic/research sites and NGOs in South Africa, Taiwan, Singapore, Thailand, Peru, Belize, Guinea, Sri Lanka, Kenya, Indonesia, Cambodia, Guatemala, the Comoros Islands, Liberia, and around the US. In doing so, the NSRC has been careful not to compete with commercial providers, but has acted as a stepping-stone for these sites, while assisting them in developing more 'normal' arrangements. From the late 1980s through the mid-1990s, the Network Startup Resource Center (via PSGnet) operated FidoNet's international links from North America to the the rest of the world's regions. Consisting of a few dozen direct dial-up links to Argentina, Australia, Germany, Hong Kong, the Netherlands, Singapore, South Africa, Taiwan, Thailand, and the UK, these links essentially bound FidoNet across the globe from the former USSR, through Europe, the Middle East, North and South America, Oceania, Africa, and Asia. For a number of years, the NSRC served as a major gate between FidoNet and the Internet, moving over 3000 messages per day. For a bit more about the early efforts of the NSRC, and some of the technical and social issues involved with networking in developing areas, see Expanding International Email Connectivity--Another Look, published in ConneXions 93.6.30. The NSRC collaborated with the Internet Society to create a TCP/IP training workshop for engineers from developing countries, which was held at Stanford University, California in August 1993, and became what is now known globally as the INET workshops. Randy Bush was the the lead instructor for the INET 1993's technical education program, working with Geoff Sears, Steve Fram, Scott Weikart, and many friends in the Internet community. The NSRC also collaborated with ISOC in the planning, organization, and teaching of the University of Hawaii INET workshop in 1995, the McGill University INET workshop in Montreal, Canada in 1996, and INET'98 in Geneva, Switzerland. Since the Stanford workshop, the NSRC has hosted and facilitated a number of mailing lists, which provide a forum for students of TCP/IP workshops in which we've participated with a place to ask questions and seek technical assistance once they've returned home from the training. In addition to INET, this includes various NATO, United Nations, and Soros Foundation sponsored workshops taught in Russia, the Ukraine, and Armenia. Randy Bush also gave a routing workshop at CICESE in Ensenada, Mexico for academic networks, and co-taught a routing workshop with David Meyer at the VI Foro Permanente de Redes de América Latina y el Caribe in Santiago, Chile. Bush also instructed with Alvise Nobile at the first network training workshop held in Trieste, Italy in 1992, and with Ermanno Pietrosemoli at the first Escuela Latinoamericana de Redes (EsLaRed) in Mérida, Venezuela in November 1992, which was an outgrowth of the Trieste training. In 1999 the NSRC helped organize a one-week network training workshop for Red Universitaria Dominicana Académica y Científica (RUDAC), in the Dominican Republic, on behalf of RedHUCyT and the Organization of American States (OAS). Jose Dominguez was the principal instructor for the workshop, along with a team of folks from the University of Oregon Computing Center. Working with many African friends and colleagues, the NSRC helped organize and teach a one-week technical workshop in Cape Town, South Africa, from 30 April to 5 May 2000. The Scalable Internet Services track focused on large scale provision of UNIX-based TCP/IP services such as DNS, SMTP mail exchange, POP mail systems, managing mailing lists, RADIUS dialup authentication, building and managing web servers, and setting up Help Desk facilities. The Scalable Internet Infrastructure track dealt with configuring and operating large scale backbones. Topics included basic routing, OSPF routing, BGP routing, management of router configs, designing NOC (Network Operation Center) facilities, and establishing peering and exchange points. Here are the AFNOG 2000 workshop materials. The training was followed by the inaugural AFNOG meeting, and a one-day AfriNIC meeting to plan for the creation of an African Regional Internet Registry. Here is a brief financial statement summarizing the funding sources and expenses for hosting the inaugural AFNOG educational workshop and meetings in Cape Town, South Africa. 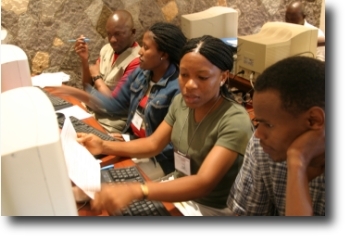 AFNOG 2 was held in Accra, Ghana in May 2001. Here are the workshop training topics and materials, and a copy of the 2001 financial statement, summarizing contributions and costs for the workshop and meetings. Thanks to the numerous publishers that donated books and CDs to the workshop. They were greatly appreciated by the workshop participants. The AFNOG 3 workshop and meetings were held in in Lomé, Togo from May 5 - 14, 2002, to promote, develop, and enhance networking expertise on the continent. There were three tracks in Togo; Scalable Internet Services and Scalable Internet Infrastructure were taught in English, and Infrastructure Réseaux IP was taught in French. 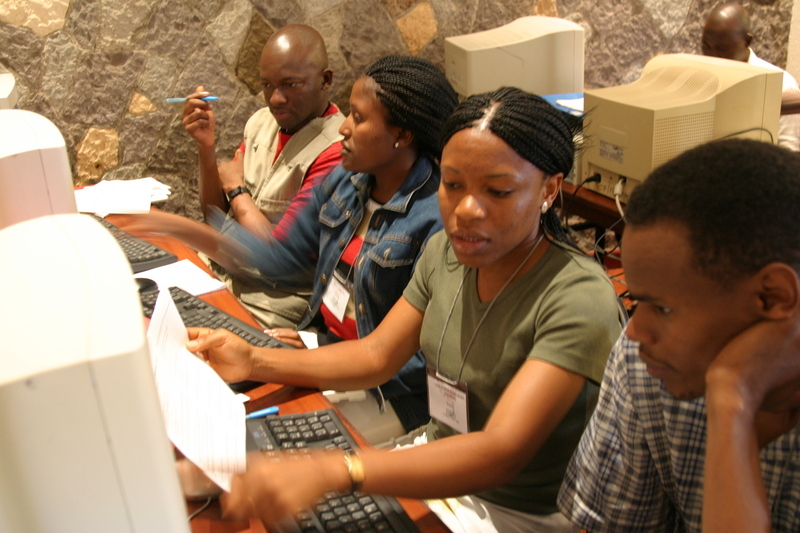 Here are the AFNOG 2002 Network Training Workshop materials. In many cases, the critical factor preventing a network from becoming operational, or evolving to the next level, is a single, marginal, piece of hardware that may be quite inexpensive in the grand scheme of things. The NSRC coordinates donations of computing and networking hardware by bringing potential recipients and potential donors together. In addition technical documentation is often expensive, and difficult to obtain for developing area networks, so we focus on helping build technical libraries in locations where the resources can be freely shared - academic departments, university libraries, and centrally-based networking facilities. 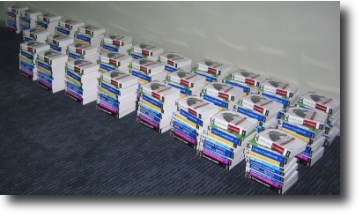 In support of the NSRC's efforts to provide technical documentation to developing area network operators, Oreilly Media, Inc., Wiley Publishers,, Cisco Press, Addison Wesley and Benjamin Cummings, and Prentice Hall have collaborated with us, and generously donated many books over the past several years. The NSRC also has good working relationships with numerous ISPs and university networks in the US that donate equipment for distribution to areas in need. Some equipment has been donated directly from companies such as 3Com, Cisco Systems and Google, Inc. With assistance from the University of Oregon Computing Center, the NSRC facilitates refurbishing the hardware (if necessary) and shipping it to academic networks and nascent ISPs in developing areas. 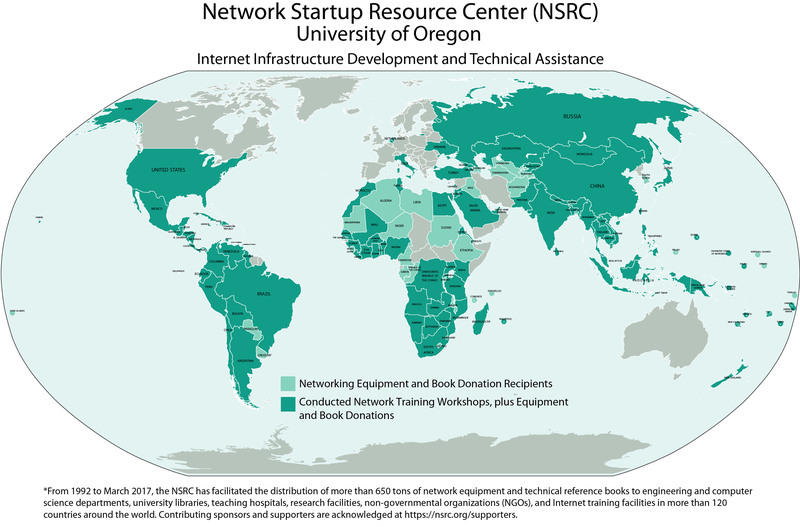 To date, the NSRC has facilitated the distribution of more than 650 tons of network equipment and technical reference books to engineering and computer science departments, university libraries, non-governmental organizations (NGOs), and networking training facilities in over over 120 countries in the world. The countries include: Afghanistan, Algeria, Argentina, Armenia, Angola, Azerbaijan, Bangladesh, Belize, Benin, Bhutan, Bolivia, Botswana, Brazil, Burkina Faso, Burundi, Cambodia, Cameroon, Chile, Colombia, Comoros Islands, Congo-Brazzaville, Cook Islands, Costa Rica, Cote d'Ivoire, the Democratic Republic of the Congo, Djibouti, the Dominican Republic, East Timor, Ecuador, Egypt, El Salvador, Eritrea, Ethiopia, Fiji, Gabon, Gambia, Georgia, Ghana, Guatemala, Guinea, Guyana, Haiti, Honduras, India, Indonesia, Iraq, Jamaica, Kazakhstan, Kenya, Kiribati, Kyrgyzstan, Laos, Lebanon, Lesotho, Liberia, Libya, Madagascar, Malawi, Mali, Mauritania, Mauritius, Mexico, Micronesia, Mongolia, Morocco, Mozambique, Myanmar, Namibia, Nepal, New Caledonia, Nicaragua, Niger, Nigeria, Pakistan, Palau, Panama, Papua New Guinea, Paraguay, Peru, Philippines, Rwanda, Russia, Samoa, Saudi Arabia, Senegal, Seychelles, Sierra Leone, Solomon Islands, South Africa, Sri Lanka, Sudan, Swaziland, Tajikistan, Tanzania, Thailand, Togo, Tokelau, Tonga, Trinidad and Tobago, Tunisia, Turkmenistan, Uganda, Uruguay, Uzbekistan, Vanuatu, Venezuela, Vietnam, Zambia, and Zimbabwe. The National Science Foundation, the Internet Society, the Carnegie Corporation of New York, the International Development Research Centre, NetworktheWorld.org and the O'Reilly Foundation provide the NSRC with funding to cover the shipping costs of the donated books, supporting our efforts to spread the knowledge and educational resources. Books and workshops are critical, but hands on experience in larger networks gives an engineer operational perspective and confidence which is not otherwise available by any other means. The NSRC has been doing this informally over the years, by hosting engineering interns from Argentina, the Congo (DRC), Ghana, Peru, Sri Lanka, and Kenya, and the results have been very positive. A book donation from O'Reilly & Associates, Inc.
and FreeBSD Mall for the PacNOG2 workshops. The Network Startup Resource Center was formalized in 1992 by Randy Bush and John Klensin with support from the National Science Foundation (NCR-9216064). Here is the original NSRC announcement. The has allowed the NSRC to continue its efforts of assisting development of the international networking infrastructure, in collaboration with the Advanced Network Technology Center (ANTC) of the University of Oregon. A supporters page is available here. Thanks to Network Services at the University of Oregon and to Verio, for providing our IP connectivity and for hosting machines that we use to provide IP services to various developing area networking projects.